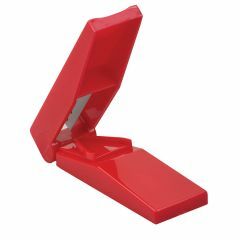 The Pill Cutter simply cuts the pill cleanly to make it easier to swallow or to provide half the dosage. Just press the lid tightly on the pill and the stainless-steel cutting edge safely splits the pill. Up to 1/2" in diameter. Another splitter that our customers often buy is the Vitaminder Splitter/Crusher combination. Aside from the cool name, this handy unit both crushes and splits pills plus it contains a storage area. This one includes all the features and is perfect for taking along with you in purse, pocket, automobile, or desk. Thanks again for stopping by. We hope to see you again soon!